On 20th of September 2018 „TELUS International Europe” in partnership with „Gorata.bg”, more than 800 team members together with their families were planted more than 12 000 young trees at 16 decares of land in Dolna Dikanya village. Those trees were planted on-site, which, according to experts, are best suited to grow and flourish in the local terrain. The area, where all coniferous vegetation was destroyed by insects and tree bugs, was completely cleaned and reforested by volunteers and representatives of the State Forestry Department. 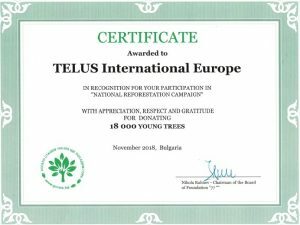 The forest was named “TELUS International Forest”, and the company has made a long-term commitment to the cultivation and conservation of its trees. The planting is part of our efforts to protect the environment and reduce its carbon footprint globally.